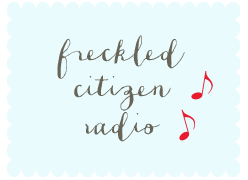 Freckled Citizen: Au revoir! Auf Wiedersehen! I'm taking advantage of what I expect may be my last clearly thinking moment until I step on the plane to bid adieu for the holidays. While we'll miss our stateside holiday traditions this year - and of course the familiar faces that come with them - we're thrilled to do something just for us this year. Seeing the world a little bit this Christmas just feels right, especially since some other familiar faces are involved. 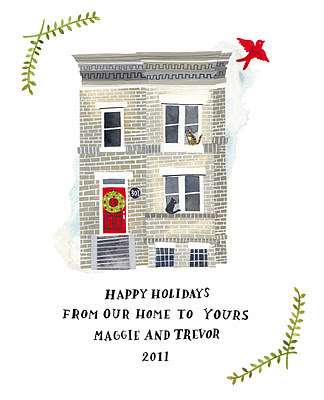 As my parting gift, I offer our 2011 holiday card, which makes me embarrassingly happy. Our house portrait was done by the lovely Rebekka Seale (whose blog is also lovely), and I couldn't be happier with how it turned out. Even better, after our cards are all sent away in the mail, we have a portrait ready for framing that we can enjoy each day of the year. Best. Card Idea. Ever. Thanks for the fun and the conversation we've shared over the year, friends. I hope each of you has your merriest holiday season yet! i LOVE your card. i'm totally stealing this next year if we ever get the front of the house looking better. have so much fun on your trip! can't wait to read about it when you return! So long! Farewell! I'm jealous of your tri-iiip! omg. love this card. the painter has a great style. have fun! yes, to toki underground date after the new year. Bye Maggie!! Hope you have a wonderful trip and an amazing holiday! I know you will! Your Christmas card is perfection. Love! I swear I gasped out loud movie-style when I saw that perfect card of yours - LOVE. Bon voyage, and happy holidays! This is the most creative card I have ever seen. I love it! Have a wonderful trip! 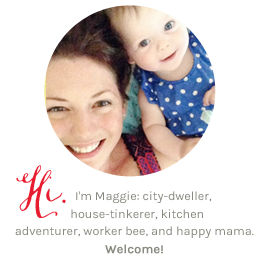 Maggie, I love your blog! I've added it to my reading list. You may have inspired me to start blogging again :) Safe travels!! It was so lovely and wonderful working with you on this!!! How did the printing turn out? ?